How going global benefits your business and where to begin. We live in this amazing time when the world is a small place and customers can buy from virtually anywhere. Now more than ever, exploring global opportunities is a great idea as it opens up a new, larger customer base and introduces even greater potential for higher profit margins. With relatively low cost of advertising online and via social media, the world is your oyster! Let’s look at a few examples of how going global benefits your business and where to start, should you choose to explore foreign opportunities. Your brand is seen as international when you sell to more than one country which adds value in the eyes of your existing and potential clients. Don’t put all your eggs in one basket. Going global can be a smart move to diversify your sales. If your local market goes through some kind of economic turbulence or decline you can rely on international markets as a backup. Even seasonal differences around the world can play a role in your sales ebbs and flows. There are many fast growing markets in the world that are less competitive and less saturated with products than North America. Opportunities for expansion are numerous, especially when you choose to expand to lesser known markets. New markets can bring in millions of new visitors to your website per day. There are 7 billion people on the planet and less than 600 million of them live in North America. The potential to increase your customer database is impressive! Amazon sales in Europe alone are over $3 billion. China is now a major global consumer of luxury goods and it accounted for nearly 47% of retail eCommerce sales worldwide in 2016. That’s millions of potential new clients! Now that you see the benefits of having a global presence, where do you start? Set your goals and evaluate the resources you are willing to invest in developing your business in foreign markets. Start with figuring out where your products fit in those markets and how you are going to get them where you want them to be. Understand how your industry works and who your main competitors are. Map out your strategy on how to enter these global markets. There are many ways to do it, so think of what way works best for you, whether it is exporting, licencing, a joint venture, etc. Conduct preliminary market research first using your own resources. Once you see the general picture, you can involve a local research organization to fill in the blanks. You need to be well informed to make educated moves. Each country has a chamber of commerce where you can get a lot of valuable information. There are also organizations whose main goal is to help foreign businesses that want to invest into the local economy and to help them navigate through local laws and regulations. Think about how you’re going to enter the market. Will you use local companies (agents) to distribute your product or will you open a company owned branch? Understand the legal regulations and learn what’s involved. Finding a foreign distributor or partner would be the easiest approach and the internet is a great help. Make sure to ask for references. Simplified trade laws and regulations are available for certain countries. Check the list of the countries that have trade agreements with your country. It might be easier to start your foreign expansion from there. It’s easy to deliver your products globally with the help of shipping companies, but laws and regulations are different for every market. Legal aspects like taxes, regulations or labeling play an important role. It’s best you hire a local lawyer to help your company figure out the specifics. Do you know how the local people do business? Do you know what is important to them and what is not? Get to know local customs and people you are dealing with before talking business. Be eager to learn about the new country and their history. Learn common gestures and body language. The North American way is only good for doing business in North America. We can help you reach millions of new clients with minimal investment. 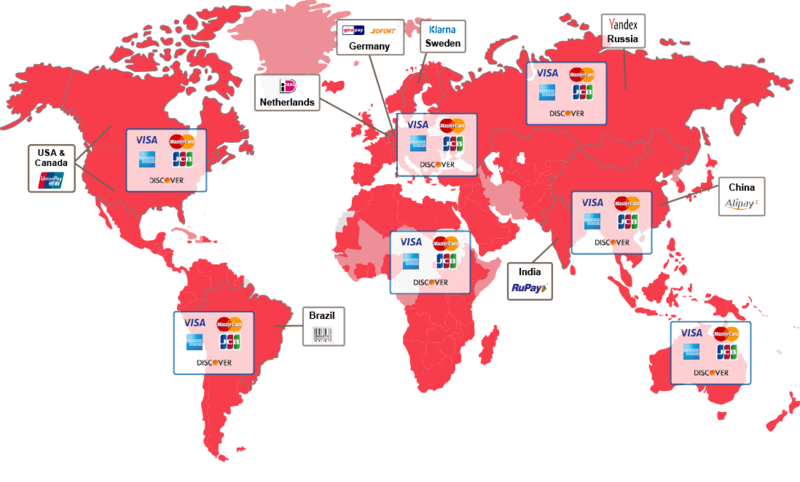 We are principal members of UnionPay International, the largest card issuer in the world. We offer your foreign customers to pay in their local currency with multi-currency pricing. We help you better manage transaction fees by automatically routing to the most cost efficient acquirer.